How to Play AVI or WMV on Mac OS X Lion? I installed Lion yesterday, and suddenly Quicktime can't play the video part of .avi or .wmv files (it can still play the audio). I re-installed Flip4Mac but that didn't fix it. VLC still works, but now I can't view the files in Safari b/c Quicktime is responsible for playing them there. Any advice on what to do? Thanks! In fact, many Mac users, who upgraded their Mac to OS X Lion 10.7, have figured out that QuickTime cannot recognize their AVI or WMV videos which used to be played smoothly in QuickTime. If you want to play WMV or AVI videos on Mac OS X Lion you can convert the WMV or AVI videos to QuickTime MOV on Mac OS X Lion with iFunia Video Converter for Mac. Which can help you convert your WMV or AVI files to QuickTime format or any other popular file formats like MP4, WMV, MOV, FLV etc. Launch iFunia Video Converter for Mac, drag and drop or click the Media Browser icon at the upper right corner to import the WMV or AVI videos. It supports to import videos in a batch and convert at a time. Step 2: Select Common Video - MOV Video format. The key point to play WMV or AVI on Mac OS X Lion is to select MOV as output video format from the "Output Format" drop-down list, If you want to put the output MOV files on your iPad, iPhone, iPod, Apple TV or other popular portable devices for playback, you can choose the presets for Apple devices as the output format. Tips: You could set resolution / video codecs, frame rate, bitrate according to your needs, but it's recommended to use default setting. When the settings are done, click the button to start conversion. 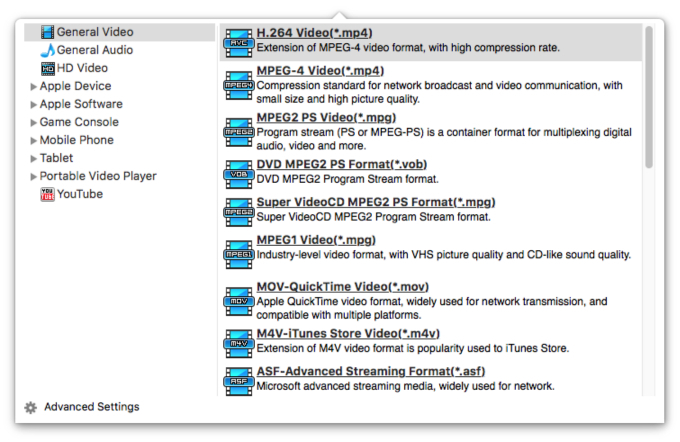 And then the OS X Lion Video Converter will automatically start to convert WMV or AVI to Mac OS X Lion. When the conversion is done, you can play the output MOV videos in QuickTime, edit them in iMovie, Final Cut Pro, or put them on your iPhone, iPad 2, Apple TV, or other devices. This Mac Video Converter is especially designed for Mac users and is also fully compatible with macOS 10.13 High Sierra.